There are many factors to consider when choosing angel investment. How should you compromise between capital and relevant expertise? What are angels really looking for? What should you do if your partnership isn’t working out? 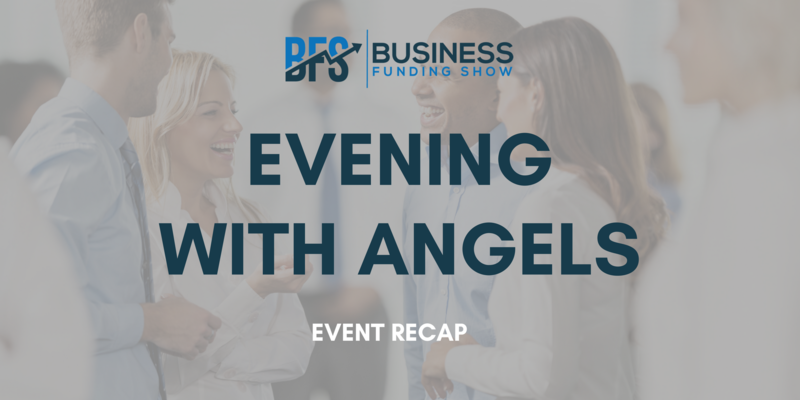 BFS invited representatives from selected top UK Business Angel Networks to our ‘Evening with Angels’ to address these burning questions. Attending funders included: Xavier Ballester from Angel Investment Network – the largest investment community in the world; Katerina Sanchez-Schilling from SyndicateRoom – a sophisticated investor-led crowdfunding platform; Oliver Wooley from private investor network Envestors; Colin Spiller from Angels Den; Alexander Sleigh from Newable’s Private Investing branch; Tim Mills from Angel Co Fund, which invests alongside angel syndicates; Arti Bareja from ClearlySo – Europe’s leading impact investment bank; and Karen Holden from A City Law Firm, voted the most innovative law firm in London. In what ways can angels add value to a business? Essentially, it is their expertise, knowledge and contacts that play a massive role. Sophisticated investors can also provide validation. As Oliver explained, if you can show other investors that you’re already backed by a smart, reputable person, who believes in what you’re doing, this is likely to attract more funders. Once an angel joins your board, they can open up their network and introduce useful people to the business, which can help immensely with later fundraising, assures Tim. Xavier assured us the key is talking to as many people as possible about your business. Anyone who invests at the seed level might already be thinking about future rounds. All you have to do is grow your company in the right way. Importantly, you should keep funders up to date with your business – if you’ve got progress to report, those who are keeping track of you might well decide to invest. What lies beyond the basics? Perfect pitch, great idea, team, chemistry… what else? ‘Traction and proof of concept’, says Arti. Sometimes people come in and say, ‘I’ve got a concept, and it’s going to work, I just know it’. Inevitably, angels are left asking themselves if that really will be the case – and most of the time faith alone is not enough. ‘Sincerity’, puts in Alexander. Essentially, this means entrepreneurs shouldn’t set unrealistic goals, because when they fail to hit them, their investors’ confidence in them will fall. If you are sincere and honest in going forward, however, and hit your goals every time, this will give your investors validation and confidence in your execution. · Our panellists were careful to outline that capital from the wrong individual can be very detrimental – especially in the case of an angel who is heavily involved, but has no chemistry with the team. · Conversely, someone who has a vast amount of knowledge, connections and experience in your industry, can be more valuable than a large injection of money. As Katerina explained: someone who comes in and says: ‘I want to sit on your board; I’ll give you a £100K’, and then steers you in the wrong direction, is going to ultimately be more harmful than someone who might give you just £10K, but knows exactly where to steer you. Colin also suggested that commitment is an incredibly important quality in an angel investor. Crucially, if you have someone who is really going to help you when the chips are down (like supplying an emergency loan), this is very valuable. Karen outlined that despite all the scaremongering that’s going on around Brexit, certain doors have actually started to open in terms of international investment. ‘I’m seeing clients who are getting Singapore or Chinese money; there’s also a lot of movement from Dubai over to the UK’, said Karen. She also pointed out that increasingly difficult laws and fees over in Americaare beginning to urge certain US companies to raise money in the UK, which is another positive piece of evidence that the British investment market is thriving right now. ‘If this will continue in the future, I can’t say’, ended Karen. · Do some research, engage with people, understand what you’re getting into, make sure you get some decent professional advice. · Once an investor puts money into a business, there is no insurance against any losses that might occur. · Once an entrepreneur signs an agreement with the angel, this partnership (good or bad) might last for a very long time. ‘The majority of angel investments last longer than most marriages’, points out Alexander. Therefore, you will do well to think twice before making decisions; ‘It’s very easy to accept an investor who dangles a check in front of you; I can’t tell you how many people sign a template document and then hand it to me for review’ – throws in Karen. It is understandable that the legal aspects of entering a partnership with an angel can be very hard to grasp. If you walk out of a tax meeting not comprehending a word of what has been said – don’t be afraid to ask for help! ‘Tech industries, and propositions that are highly scalable’, says Katerina. Essentially, investors want to see scalability as this means a bigger exit. As Tim explained, ‘There are instances where angels invest purely in IP, which tends to be in life sciences and certain areas of engineering and technology’. Impact investing is also quite a growing sector, with companies looking to not only make a financial return, but a significant social impact, giving back to communities. Karen: ‘In my experience, gender isn’t important to investors who review your business. I think women need to become more confident; I would encourage them to reach further, to go beyond – they are certainly as capable as men!’. Katerina: ‘We need to make a collective effort to eliminate any sub-conscious biases, creating inclusivity on both frontiers: among investors as well as entrepreneurs’. With a huge turnout, we hope that our ‘Evening with Angels’ was useful to all our attendees, and that after following the tips and advice of our panellists, it will have brought them a step closer to their perfect partnership with an angel investor! Missed this event? We have our ‘Funding for Science, Tech & Innovation’ event coming up on the 16th of October, which will take place at WeWork Moorgate. If you’re in these sectors, you won’t want to miss it! Click here to book your tickets.